You are a photographer with experience in the Arabian Horse environment and/or you have an extensive archive of Arabian Horse photos? 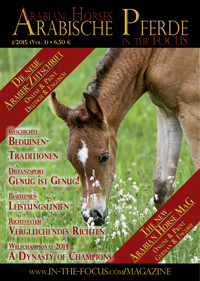 then you may apply for collaboration with "In the Focus" - the Arabian Horse Online Photo Agency. • All you have to do is to send a request through the following form and sign-up. Your application will be checked and we will come back to you with further details and conditions. • Signing-up is free. Once your application has been approved, we handle all of the sales, promotion and customer support and take a commision from every photo you sell.